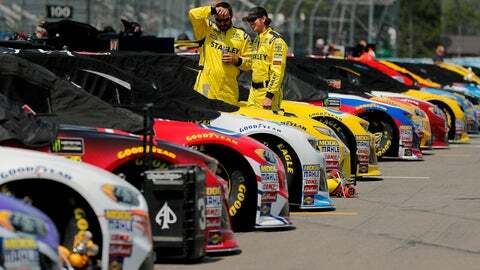 Chase Elliott has won the NASCAR Cup race at Watkins Glen, holding off Martin Truex Jr in a scintillating finish. Truex ran second to Elliott for the entire final stage before beginning a steady close. It was a two-car race as the rest of the field was more than 11 seconds back. Truex closed to the back bumper of Elliott’s No. 9 Chevy heading out of the first turn of the final lap, skidding sideways, but Elliott pulled away and Truex sputtered home second, out of fuel. It was Elliott’s first career win in his 99th Cup start and 250th for Hendrick Motorsports. Kyle Busch finished third, followed by Daniel Suarez and Erik Jones, a triumvirate of Joe Gibbs Racing Toyotas. Truex was bidding to become the first Cup driver to win three straight road races since Tony Stewart accomplished the feat just over a decade ago (2004-05). Jeff Gordon is the all-time leader with six in a row 1997-2000).